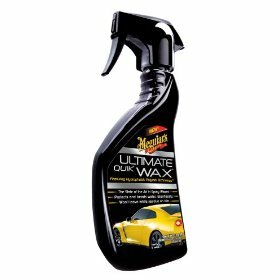 Meguiar's® Ultimate Quik Wax is the fastest way to a dazzling, show-car shine! Featuring Meguiar's Hydrophobic Polymer Technology™, it makes paint come alive with a deep, wet-look shine you would only expect from liquid or paste waxes. Our new technology leaves no white residue on plastic and trim, and it can even be applied in direct sunlight! Simply mist on and wipe off. So fast and easy that you can wax your entire car in just minutes! The protection and relentless water beading, however, lasts for weeks.